Our 2017 State of Operations and Outsourcing study with KPMG, covering 454 major enterprises, shows the hi-tech and financial services industries leading the way with, respectively, 53% and 44% already making significant investments in RPA over the next couple of years. Only retail falls below 30%, which may be a result of highly distributed organizations finding it if challenging to find high-throughput, high-intensity process where there is real tangible ROI for the investment. Quite simply, you can't be an effective digital organization if you don't have your manual processes digitized and automated. That's what RPA does. All software and hi-tech firms have to transact their services over digital channels, and most tend to be further along the change curve when it comes to automation. Net-net, hi-tech's DNA is all about automation, so having a digitized back-end just fits with how they view the world. For banks, these companies are plagued by manual processes and many have taken the plunge in recent years with large RPA teams to help them meet compliance deadlines and standards - almost every major bank has an RPA story unfolding. Insurance is catching up too, especially those with archaic claims processing workflows. Moreover, many insurers were among the first to exploit offshoring over the last 10-15 years, and moving along an RPA path is a natural progression for many of them. Energy and utility firms are all about cost control these days, while healthcare orgs are among the most backward when it comes to legacy technology and process. As patient care moves into the digital era, the need to digitize those manual records has never been more dire. However which way we look at it, RPA is on a major growth trajectory... our forecast may be too conservative, but we believe many organizations will be surprised at how much time it will take to get their act together to adopt RPA in the right way. However, the newbies should be able to learn from the pain of the early adopters to move along the RPA adoption cycle faster. Phil - Thanks for sharing. 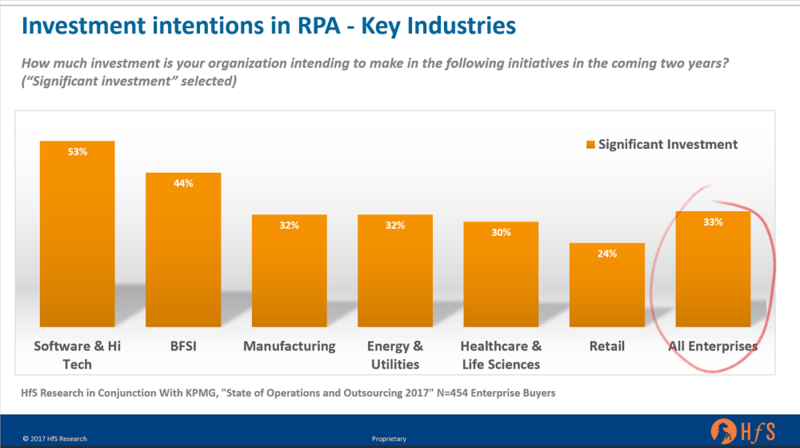 Interesting to see that Retail trails in investing in RPA than other industries in your survey. As Retail business goes more online shouldn't the RPA opportunity increase significantly in areas such as customer self service, replenishment etc? Take example of @Amazon dash/echo based ordering for a category like washing detergent in your home. The process could be automated all the way from order process to shipping (no human intervention) needed up until someone unloads the detergent from the truck in front of your home (last mile, assuming no drones). Any problem during this process as a customer you check with Alexa and chat. There are several such opportunities in retail that could be taken advantage of.